The Department of Biotechnology has designed a multi-disciplinary curriculum, supported by the infrastructure, research and development (R&D) activities. The department has established core service laboratories with generous infrastructural and financial support from the university with provision for regular up-gradation. The department has been successful in obtaining grants from the Govt. of India including Department of Biotechnology (DBT) and Ministry of Environment and Forests (MOEF, MoES). The Department has six staff with doctorate degree from various specialized fields of Biotechnology, viz. 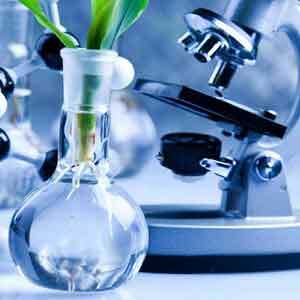 Plant Tissue culture, Human Molecular and Microbial Genetics, Environmental Science, Cancer Biology and Biochemistry. The members have excellent records of paper publication in national and international journals with high impact factors. The department encourages co-curricular activities by organizing frequent workshops, seminars and guest lectures of national and international repute to promote interaction and to identify areas of mutual interests. The department has also helped the students to link with reputed research Institutions like University of Madras, Central Leather Research Institute (MoU executed), Central Institute of Brackish water Aquaculture and Apollo hospitals Pvt Ltd, Life cell, King Institute, Institute of Basic Medical Research (MoU executed). The Department extends its expertise by offering consultancy services for developing green environment by distributing seeds and saplings, teaching the technique of mushroom culture and Vermicomposting. Medical camps are organized to create awareness against dreadful diseases like Cancer, hypertension and Diabetes. Our students participated and bagged several prizes for the Best Poster in National and International seminars, symposia, conferences and technical quiz programmes conducted by various institutions. Our Alumni are placed in various leading companies and some of them pursue higher studies in National and International Universities. To provide quality education for the young students and to expand their knowledge and understanding on the cutting edge technology of scientific and engineering principles underlying the field of Biotechnology. The department is committed to train students to utilize their knowledge and expertise for the rapidly growing Biotechnology industry and to achieve a good working co-operation with experts from other related fields, also encouraging and preparing them for research activities in Biotechnology. Dr. R.Devika, is basically an environmentalist with M.Sc.,M.Phil.,PhD., in Environmental Sciences and M.Tech in Biotechnology and PhD in Bioengineering. She has 19.5 years of academic experiences and 4.5 years of industrial experiences. She has 62 paper publications in various National and International referred journal and published on book “Enzyme” covering the curriculum of Engineering stream. She had guided 18 M.Phil scholars, 18 PG studenta and 42 UG students. At present she is guiding three PhD scholars. She is a life member of Indian Science Congress, The Indian Society for Technical Education, New Delhi, Society for Biotechnologist, India, Society of Biological Chemist, India., Indian Association of Biomedical Scientists and International Association of Engineers. She is a recipient of few awards like “Highest Research Paper Publications - 2018”, “Life Time Education Achievement Award-2016”, “Bharat Ratna Mother Teresa Gold Medal Award”, “Bharat Jyoti Award” and “Certificate of Excellence”, “The Best Citizens of India Award”, “Swathik Award for Proficiency”. 1. Engineering knowledge: Apply the knowledge of mathematics, science, engineering fundamentals, and an engineering specialization for the solution of problems in the area of Biotechnology. 2. Problem analysis: Identify, formulate, review research literature, and analyze complex biotechnology- oriented problems reaching substantiated conclusions using first principles of mathematics, natural sciences, and engineering sciences. 3. Design/development of solutions: Design solutions for complex bio-based problems and design system components or processes that meet the specified needs with appropriate consideration for the public health and safety, and the cultural, societal, and environmental considerations. 5. Modern tool usage: Create, select, and apply appropriate techniques, resources, and modern engineering and IT tools including prediction and modeling to complex engineering activities with an understanding of the limitations in the area of biotechnology. 6. The engineer and society: Apply reasoning informed by the contextual knowledge to assess societal, health, safety, legal and cultural issues and the consequent responsibilities relevant to the professional practice. 7. Environment and sustainability: Understand the impact of the professional biotechnological solutions in societal and environmental contexts, and demonstrate the knowledge of, and need for sustainable development. 8. Ethics: Apply ethical principles and commit to professional ethics and responsibilities and norms of the technology practice. 10. Communication: Communicate effectively on complex engineering activities with the technology audience and with society at large, such as, being able to comprehend and write effective reports and design documentation, make effective presentations, and give and receive clear instructions. PO1: To identify, formulate, design, analyse and develop processes and technologies for biotechnological products for societal usage and economically sustainable for the present and future. PO2: To assess the human health and environmental issues and provide relevant professional mitigation measures and implementation of biotechnological tools. PO3: To function in a multi-disciplinary team and understand the professional ethics and responsibilities and equip themselves for higher learning for addressing technological challenges. PEO2: Address the nuances of biotechnology in real life on application of microorganisms in industrial production of enzymes and products, downstream processing, genetic engineering, tissue culture and applications. PEO3: Identify, design and develop biotechnological process and technologies to meet the industrial challenges and produce tools which a sound and economically viable and sustainable.